Varicocele is swollen testicle veins. It is the number one cause of male infertility. It is caused when blood does not ciruclate well and pools in the pampiniform plexus veins. Pooled blood stretches and enlarges the veins, making them varicose. 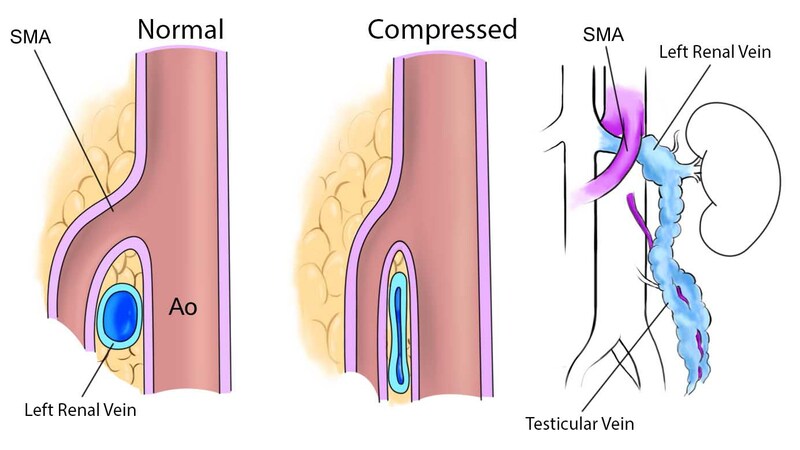 Contarary to popular belief, varicocele is not a genetic disorder of faulty vein valves, nor have any genetic components been found for varicocele. Many risk factors contribute to varicocele development. Every case is very different. Activity type: E.g. heavy lifting, jumping activities, biking, etc. For a comprehensive list that includes treamtents, please refer to the Healing & Pain Relief Guides. Most varicocele risk factors are controllable. Natural treatment is about treating the controllable varicocele risk factors. Why Does Varicocele Cuause Pain & Infertility? Varicocele is pooled blood. Pooled blood is toxic and damages the testicles. Some of the damage is reversable, but some is perminent. Varicocele toxic blood pooling is responsible for all varicocele symptoms, including pain and infertiltiy. Varicocele pain is simply an indication that the testicles are under stress or are being damaged. This is why is critical for those who suffer from varicocele to start a treatment as soon as possible--to minmize perminent testicular damage. Infertility indicates that the testicles have already undergone considerable stress and damage from toxic varicocele blood pooling. Those who have infertility likely have some perminent damage. For those who have infertility, varicocele treatment is highly advised and urgently required.